Grant, we pray, almighty God, that we, who glory in the Heart of your beloved Son and recall the wonders of his love for us, may be made worthy to receive an overflowing measure of grace from that fount of heavenly gifts. Through our Lord Jesus Christ, your Son, who lives and reigns with you in the unity of the Holy Spirit, one God, for ever and ever. Devotion To the Sacred Heart: Part I | P. Milward S.J. 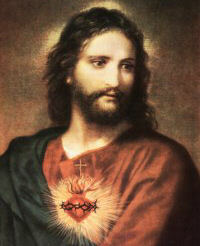 Devotion To the Sacred Heart: Part II | P. Milward S.J. The Human Heart of Jesus | Herbert Ratner M.D. The Sacred Heart And The Eucharist | Fr. John A. Hardon S.J. Worship Of The Physical Heart Of Christ | Fr. Bertrand de Margerie S.J. "I promise you in the excessive mercy of my Heart that my all-powerful love will grant to all those who receive Holy Communion on the First Fridays in nine consecutive months the grace of final perseverance; they shall not die in my disgrace, nor without receiving their sacraments. My divine Heart shall be their safe refuge in this last moment" (Jesus to St. Margaret Mary). Sixteenth century Calvinism and seventeenth century Jansenism preached a distorted Christianity that substituted for God's love and sacrifice of His Son for all men the fearful idea that a whole section of humanity was inexorably damned. The Global Rosary Relay for Priests begins at the stroke of midnight on June 8, this year, commencing in East Asia as it begins its journey around the world. We thank you for making this worldwide prayer event a success in the past as we now look forward to sharing in a greatly enhanced event for 2018, when over 100 lead shrines in more than 50 countries around the world will pray the rosary in their local language at their allocated time. Here is a message to all priests for this important day: The Priesthood Is the Love of the Heart of Jesus and the Prayers for Priests, both for priests to say for themselves, and for lay people to say for priests. According to the 1962 Missal of St. John XXIII the Extraordinary Form of the Roman Rite, today is the feast of Mary, Mediatrix of All Graces. Pope Leo XIII declared in his Encyclical of September 22, 1891: "We may affirm that nothing, by the will of God, is given to us without Mary's mediation, in such way that just as no one can approach the almighty Father but through His Son, likewise no one, so to speak, can approach Christ but through His Mother." Mentioned in the Roman Martyrology from 1961, we observe the "birthday" of St. Médard, Bishop of Noyon, France. (When the Church uses the word "Birthday" in regard to saints, She refers to the commemoration of the day on which the saint died.) Legend says that a sudden shower once fell, soaking everyone except St Médard who remained perfectly dry, because an eagle had spread its wings over him. Ever since, Médard was known as maître de la pluie—master of rain. In religious art, an eagle shelters Médard from the rain. The Church, in this month of June, giving us the solemnity of the Most Sacred Heart of Jesus, wishes us to understand the consequential devotion to Our Lady traditionally lived in the Marian month par excellence: the month of May. The Heart of Jesus is the See and Throne of Divine Mercy, revealed to the world in the passion, death and resurrection of Christ. The Holy Father Pope Benedict XVI speaking of the solemnity of the Sacred Heart of Jesus two years ago said: “In biblical language, "heart" indicates the centre of the person where his sentiments and intentions dwell. In the Heart of the Redeemer we adore God's love for humanity, his will for universal salvation, his infinite mercy. Practising devotion to the Sacred Heart of Christ therefore means adoring that Heart which, after having loved us to the end, was pierced by a spear and from high on the Cross poured out blood and water, an inexhaustible source of new life” (Benedict XVI, Angelus 5 June 2005). The call which comes from this important feast day is first of all a call to Eucharistic adoration, because in the Sacred Host the Lord Jesus is truly present and He offers each of us His Heart, His Merciful Love. To spend time in the Presence of the Eucharistic Lord, to adore Him, is the best expression of devotion to the Sacred Heart of Jesus which, as we know, spread all over the world thanks to Jesus' revelations to Saint Margherita M. Alacoque in the 17th century: “Behold the Heart which so loved mankind”! The deepest longing of Christ's Heart is that we discover how much he loves us, the extent of his tender love for creatures who, cooled by their selfishness, look only inwards at themselves, as if they were afraid to let themselves be loved unconditionally by their Creator, who asks nothing and gives all! How society, culture, economy, politics today need this Heart! It is really true, the more man distances himself from God-Love the more he becomes 'heartless', agitated about a thousand things because he has mislaid the principal one: to let oneself be loved by Christ and to respond to this Love with our love. Close to the Heart of the Son is the Heart of the Mother whom the Church celebrates the day after the solemnity of the Sacred Heart of Jesus. Let it again be the Holy Father who illuminates us with regard to this mystery: “The heart that resembles that of Christ more than any other is without a doubt the Heart of Mary, his Immaculate Mother, and for this very reason the liturgy holds them up together for our veneration. Responding to the Virgin's invitation at Fatima, let us entrust the whole world to her Immaculate Heart, which we contemplated yesterday in a special way, so that it may experience the merciful love of God and know true peace” (Benedict XVI, Angelus 5 June 2005). From the Catholic Culture Library read Enthronement of the Sacred Heart of Jesus: Sacred Scripture by Bishop Raymond Burke. Bake a heart shaped cake or cookies in honor of the Sacred Heart of Jesus.